I took a stroll through Greensboro last Thursday to get a feel for the arts & culture scene here in town. What did I find? There’s a lot more going on downtown than you might think! If you’re coming into town, you should definitely take the time to visit the Weatherspoon Art Museum on the campus of UNC-G, located on the corner of Spring Garden and Tate Street. With multiple gallery spaces, curator Xandra Eden always puts together some really great contemporary art exhibitions, and Elaine D. Gustafson curates the permanent collection. If you get there before August 18th, check out the kids are alright: an exhibition about family and photography, curated by Alison Ferris in the main gallery upstairs. This exhibition presents and challenges the notion of “family” in the 21st century. Yolanda del Amo’s Aron, Helen, Laura and Sarah, David photographs particularly struck me; you’ll have to see them yourself to find out why! Nira Pereg’s films Abraham Abraham and Sarah Sarah are on view in the Tannenbaum Gallery downstairs until September 15th. These two powerfully intimate films really make you think about the relationship between politics, belief systems, and social rituals. If the weather’s nice, the Museum’s Sculpture Garden outside offers a great place to take a quick break before you head downtown! Starting from the southern end of Elm Street, you can’t miss Elsewhere. 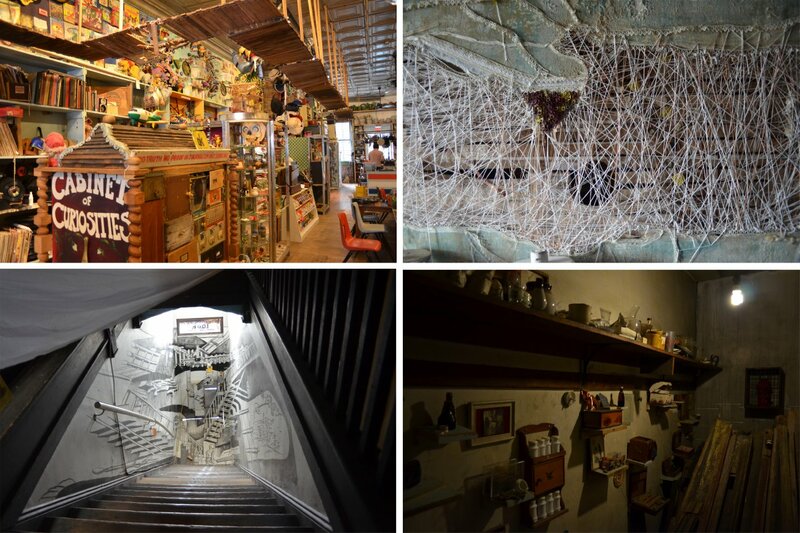 Elsewhere is a collaborative living museum in which artists make new art from old things. I distinctly remember the first time I visited a few years ago; it tore down every notion I previously held of what an “art museum” was supposed to be. You can touch things. You can interact with the artworks. Play is encouraged. At first glance, Elsewhere just looks like a space full of overwhelmingly cluttered stuff. But look closer and have one of the interns give you a tour of the space. You’ll soon see that there is a method to the madness, and the $1 admission is well worth it. There’s always some sort of event, screening, play, parade, or performance going on, so the museum is always lively. Moving up Elm Street, you’ll pass by a handful of fun antique stores on your way to the Ambleside Gallery. You’ll be greeted by the owner, Jackson Mayshark, as you enter. The dark green walls, carpet, and carved wooden door frames communicate a more formal gallery setting. Local artist James Barnhill has a few bronze sculptures for sale, and Chinese artist Guan Weixing’s watercolors are drool-worthy. Jackson will happily answer any questions you have, and if you happen to be there for a First Friday or other event, you’ll hear some incredible musicians playing the piano that sits in the middle of the gallery! Elements Gallery is just next door; this is another collaborative in which the showcased artists rotate working at the space. An exposed and faded brick wall gives the gallery so much character. I met Joy Hamlin who makes clay tiles and functional pottery. Joy used to be the curator of education at the NC Zoo in Asheboro. Now, Joy’s pottery features “tree of life” imagery – perhaps inspired by her time at the Zoo? Brad Caviness has some incredible clay pots in which he backlights intricately-carved architectural spaces. There are no words for how fascinating his work is. You definitely need to check them out! If you’re a fan of live theater, the Community Theater of Greensboro just moved into their own space on South Elm back in December thanks to their Yellow Brick Road initiative. Wendy at the CTG told me all about the theater’s close ties with the community, and how they offer classes, camps, and workshops for people of all ages. This year, the CTG will be putting on well-known shows like To Kill a Mockingbird and the Wizard of Oz, their signature show now in its 19th season. 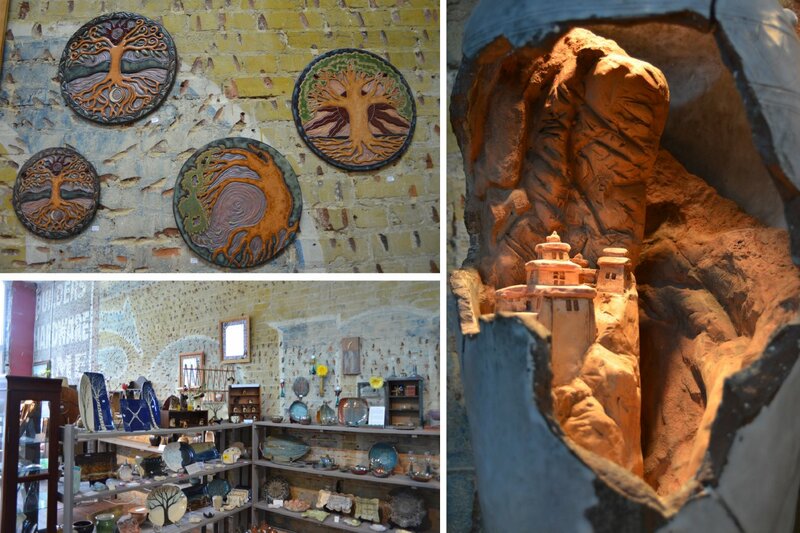 Earthworks Gallery offers one of the largest selections of pottery from North Carolina artists. Brett McDonough has some funky faced mugs upstairs; his work will also be in Greenhill’s upcoming ANIMATED! exhibition. These little creatures will all be for sale and they are all one-of-a-kind, so be sure to stop by Greenhill and see the great show in the fall. Earthworks not only houses pottery though; JF Jones has an Alexander Calder-inspired mobile hanging in the front, and there are postcards available as well. Just Be and Design Archives feature handmade jewelry, cards, apparel, stickers, wall art, and an assortment of other knick-knacks made by local artists. Just Be has some fun store décor as well as great smelling candles. Design Archives rents out booths to vendors. Their vintage clothing is killer. Make sure you check out Death By Ink’s booth for some great locally-screen-printed T-shirts, and Mata Trader’s booth for some wonderful fair trade jewelry! If you’re looking for an alternative space to look at cool art, Golden Spiral Studios and Tried & True Tattoo Company both have some wall space dedicated to 2D artworks. The works in these studios are by both the tattoo artists themselves as well as outside artists. The staffs are great, the art is edgy, and they’re both definitely worth a visit. To end your afternoon of art and culture, make your way up Elm Street, take a right onto Friendly Avenue, and you’ll run into the Greensboro Cultural Center. There are tons of art galleries, dance companies, and music groups that are sure to get your artsy side flowing. Of course, Greenhill is conveniently located in the Cultural Center, and they always have a wonderful array of programming, summer camps, exhibitions, and other events to promote North Carolina art and artists. And if you happen to be in town, don’t miss live music with Bound To Have A Little Fun at First Friday this week! Sarah-Margaret - What a wonderful tour! I felt like I was walking down Elm Street. Thanks for including Just Be in your tour! Mary Young - Thank YOU Hannah, I enjoyed my virtual tour of the places we love to visit and some we will certainly make a point to get out and enjoy the art scene in Greensboro!